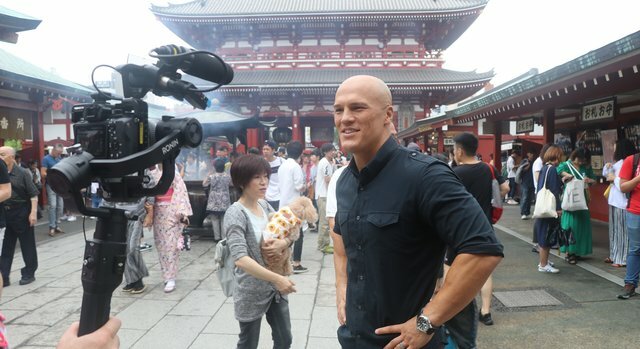 CNN sports anchor and former professional American football player Coy Wire embarks on a journey to trace his family roots in a special two-part series called True Tokyo. In part one of True Tokyo, Wire discovers more about the art and culture of Japan’s capital city. Wire learns about the ancient traditions of Japanese crafts and visits a famous Tokyo garage to see how a new generation of mechanics-turned-designers “dress their rides” as a form of modern artistic expression. During his time in Tokyo, Wire also tastes the unique cuisine of the city which boasts more Michelin stars than any other. For a night out, Wire takes in two imports to Japan: whisky and jazz. True Tokyo visits one of the city’s original whisky gurus before watching a live performance in one of the city’s oldest jazz clubs that’s making a modern-day comeback. In part two of the series, Wire explores the unique sporting traditions of Japan. On the eve of one of Japan’s biggest sumo competitions, Wire visits Tokyo’s “sumo stables” to learn how wrestlers traditionally train and prepare for a life devoted to the sport. Wire also meets gamers representing one of Japan’s newest sports: eSports, a multi-million-dollar industry and one of the fastest growing competitive sports in the world. Finally, Wire sees how Japan is preparing for the upcoming 2020 Games which includes Japanese karate masters readying young fighters to compete in one of many new Olympic sports that will debut. Saif Ali Khan, son of Indian cricket legend, Mansoor Ali Khan Pataudi, and acclaimed actor, Sharmila Tagore, has achieved a successful Bollywood career spanning over two decades. Now, Khan is starring in the successful crime series, Scared Crimes, which is the first Netflix original from India. On Talk Asia, Anna Coren speaks to Khan in Mumbai about his 25-year career, dealing with the media’s obsession with his son, Taimur, and his relationship with religion. On this month’s episode of Living Golf, CNN explores the development of junior and women’s golf. With the number of players taking up golf said to be in decline the programme looks into a number of initiatives being used, such as the R&A’s Women in Golf Charter; the US Industry’s #inviterHER campaign, and the KPMG Women’s Leadership Summit, all of which hope to empower women on and off the course. Presenter Shane O’Donoghue travels to the Evian Championship where he meets the Korda sisters, Jessica and Nelly, who are both competing in the event. O’Donoghue learns more about how the sisters developed into world class golfers and gather their thoughts on what can be done to promote golf among women and juniors. O’Donoghue also seeks the opinions of other stars including defending champion Anna Nordqvist and renowned coach David Leadbetter, who has just opened a golf academy in the Evian resort. Living Golf also explores the Arnold Palmer Cup, a Ryder Cup-style event between international and American students from the US College system. The 2018 event saw men and women compete together. At the event, CNN speaks to 10-time Major Champion Annika Sorenstam. Finally, Living Golf travels to the Barseback Golf & Country Club in Sweden for the Stenson Sunesson Junior Challenge and speaks to 2016 Open Champion, Henrik Stenson, and his former caddie, Fanny Sunesson, on why they choose to set up the tournament. Many performers internationally dream of making it big on a US stage. On this month’s episode of Inside the Middle East, the programme looks at the Middle Eastern cast in the 10-time Tony award winning Broadway play, ‘The Band’s Visit’, and how their background plays a role in their work. Inside the Middle East also meets Iranian-American comedian Maz Jobrani, who has made a living out of poking fun at his heritage while using his platform to promote cultural acceptance. Meanwhile, in New York, one Syrian singer is fusing Arabic melodies with western influences to create a new sound. Abu Dhabi is fast becoming a travel destination of world repute; offering tourists an eclectic mix of high-end luxury, adventure and cultural diversity. Destination Abu Dhabi explores some of its’ cultural landmarks including the Sheikh Zayed Grand Mosque, which attracted almost six million visitors last year, and The Louvre Abu Dhabi. Many of the 200 islands dotted along Abu Dhabi’s coast offer a luxury boutique holiday experience. Some hotels, such as the Emirates Palace and its’ gold-dusted camel burgers, have given Abu Dhabi a reputation for the ostentatious. However, the Emirate’s newest tourist attractions are catering for visitors in search of an adrenaline rush with the world’s fastest rollercoaster, Formula 1 circuit and world’s largest indoor theme park located at Yas Island.